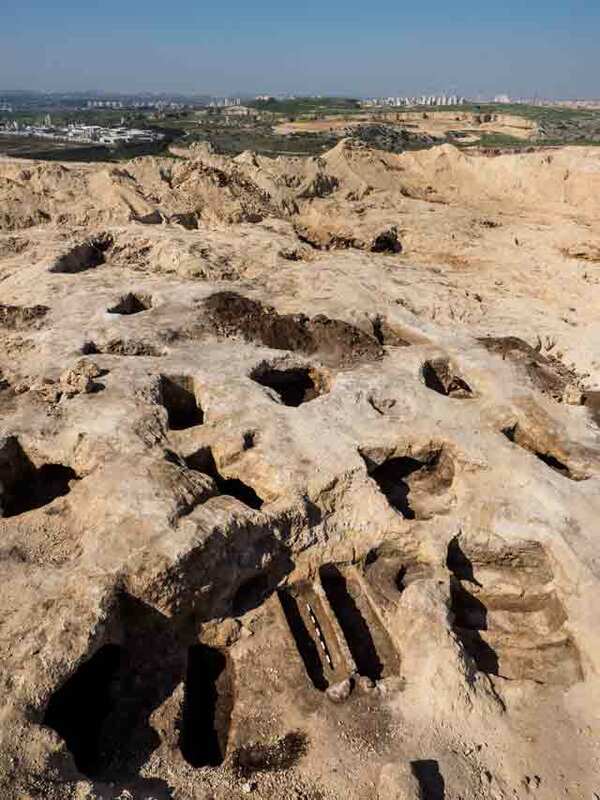 In March 2017, a salvage excavation was conducted within the precincts of the Hanson quarries in Nahshonim (Permit No. A-7939; map ref. 196585–729/663017–130; Fig. 1). 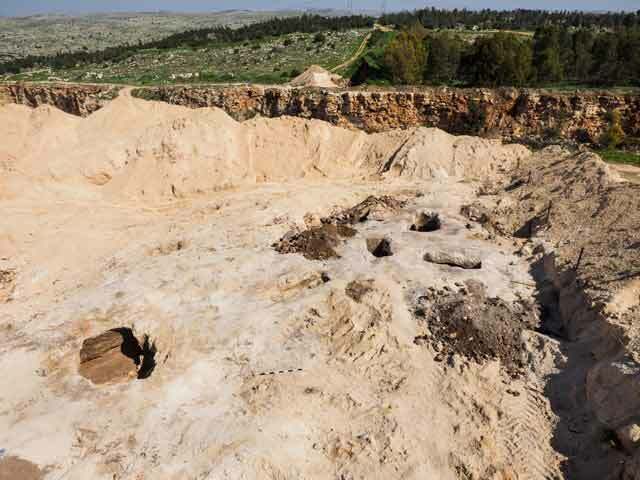 The excavation, undertaken on behalf of the Israel Antiquities Authority and financed by the Hanson Company, was directed by A. ʽAzab, R. Toueg (preliminary inspections) and E. Jakoel, with the assistance of Y. Amrani and E. Bachar (administration), D. Masarwa (preliminary inspections and area supervision), S. Krispin and D. Golan (area supervision), C. Ben-Ari (area supervision and GPS), A. Dagot (GPS), A. Peretz (field photography), U. ʽAd and L. Weinblum (computerization), R. Liran, A. Hajian and M. Kahan (surveying and drafting), M. Shuiskaya (pottery drawing), P. Gendelman (pottery reading and scientific guidance), Y. Nagar and V. Eshed (physical anthropology), L. Kupershmidt (metallurgical laboratory), as well as D. Ben-Ami and G. Itach. The excavation was conducted c. 300 m south of Horbat Zikhrin, which is located on one of the hills overlooking the eastern Yarqon basin (Fig. 1), above the southern bank of Nahal Shiloh, c. 1 km south of Horbat Migdal Zedeq (Crusader Mirabel; Majdal Yaba) and c. 6 km southeast of Tel Afeq. Not far from the site is a Roman road that connected Jerusalem with Caesarea, by way of Gophna and Antipatris, and the Mamluk post road passed north of the site. 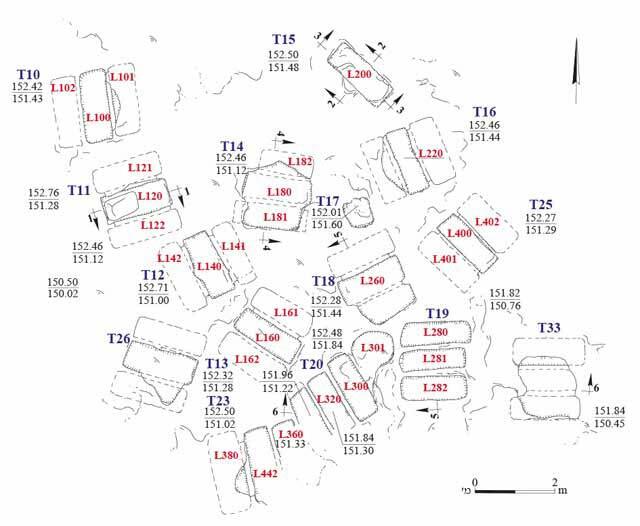 Archaeological surveys and excavations were conducted at the site in the past (Fischer 1983; 1985; 1994; Haddad 2000; 2007). The settlement at Horbat Zikhrin was founded at the end of the Second Temple period and existed continuously until the Ottoman period. The earliest structures built at the site were farmhouses; these were probably abandoned during the First Jewish Revolt. The site’s proximity to the Roman road from Antipatris to Jerusalem was a factor in the renewed activity in the settlement’s farmhouses during the Roman period (second–third centuries CE). Habitation at the site reached its peak in the Byzantine period, at which time the settlement extended over an area of c. 50 dunams and included a monastery, a hostel, a church, a bathhouse, residential neighborhoods, winepresses and large houses arranged along the outskirts of the settlement. During the Early Islamic period, dwellings were constructed within the precincts of the settlement. The settlement was greatly reduced in the Mamluk period, and was clustered in the monastery, the church and the northeastern hill. During the Ottoman period, the settlement further shrunk in size, and was confined within the remains of the monastery on the eastern hill. Concentrations of tombs were unearthed c. 100 m northeast, south and southwest of the settlement, including a loculus-type burial cave from the Second Temple period (first–second centuries CE) and numerous rock-hewn cist graves, pit graves and arcosolium tombs from the Byzantine period (fourth–fifth centuries CE). 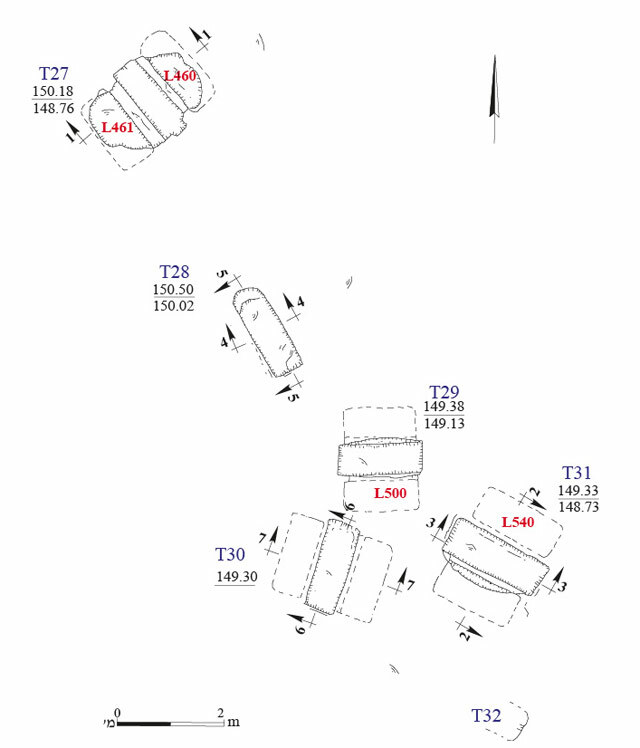 Two concentrations of tombs (Area A in the north and Area B in the south; Figs. 1–7) were discovered in the excavation, yielding 18 arcosolium tombs and four tombs whose quarrying was not completed. 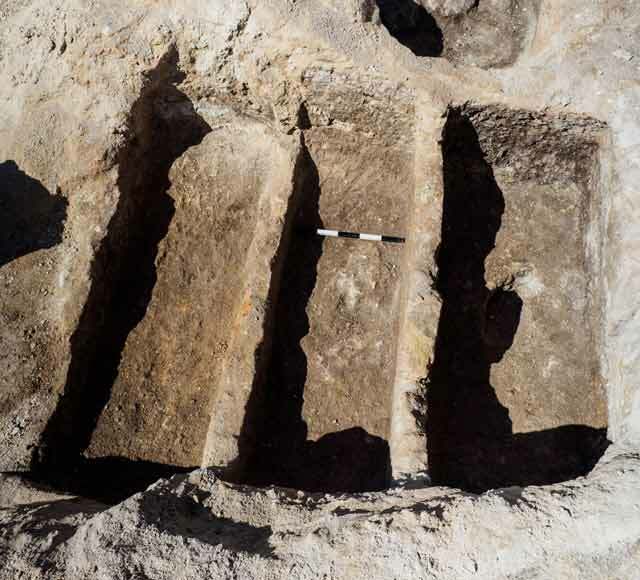 The tombs, which were partially excavated, were hewn in various directions in the limestone bedrock, and they included a shallow rectangular shaft on either side of which were arcosolia, each containing a rock-cut burial trough (Figs. 8–10). The shaft openings were sealed with either a large, thick slab that was sometimes curved or several smaller slabs that were sometimes affixed to the bedrock with plaster. The ceilings in several of the tombs were not preserved, and it seems that they were removed while preparing for previous excavations (e.g., Figs. 10, 11). The tombs were filled with an accumulation of brown soil, and the artifacts found in them were in an extremely poor state of preservation, largely due to plunder in ancient times. In Area A, bones representing at least twenty individuals were discovered in nine graves, amounting to at least two inhumations per tomb. Despite the poor state of preservation and the hasty examination of the finds, which had to place in the excavation area, three children (aged 4–5, 4–8, 9–10 years) and sixteen adults — of which two were male and one was a female — were identified. 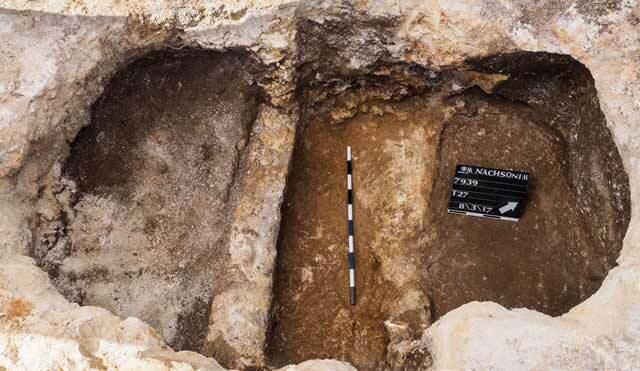 Human bones were discovered in three tombs in Area B. Only one burial bench was excavated in each tomb. Two of the tombs had a single adult each. In the third tomb were nine individuals. These included three adults—two females and one male—which were placed on the bench, indicating that they were the first to be buried. 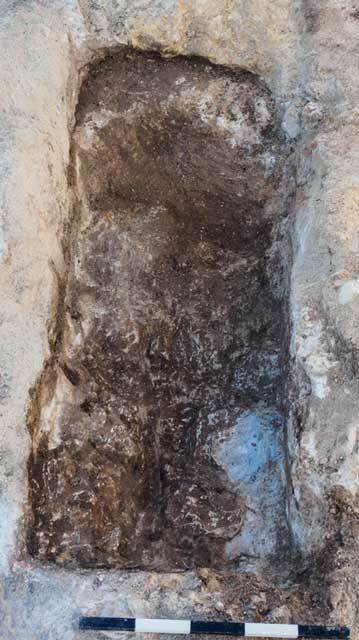 In addition, there were five children and one fetus; most of them were placed in the upper burial layer, indicating that they were the last to be interred in the tomb. The broad demographic dispersion in such a small sample leads to the conclusion that this was a cemetery for an ordinary civilian population. Pottery sherds, glassware and a variety of metal artifacts were discovered inside the tombs. Most of the uncovered finds were personal objects of the deceased, such as bracelets and earrings. Noteworthy among them is a cross pendant that was discovered in one of the tombs, and which may allude to the deceased’s religion. Judging by the finds, the burial can be dated to the Byzantine period (late fourth–early fifth century CE). In addition, several pottery vessels dated to the transition period between the Byzantine and the Umayyad periods (late seventh century CE) and a number of vessels ascribed to the Abbasid period (second half of the eighth century–second half of the tenth century CE) were found inside the tombs. 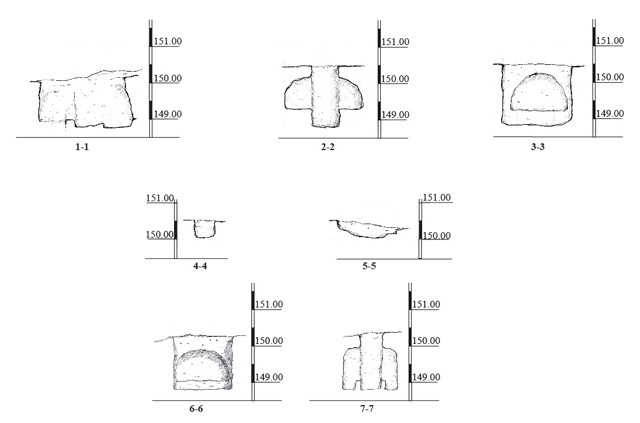 Tombs whose quarrying had only begun but for unknown reasons was never completed (Fig. 11) were identified in four locations. The excavated tombs date from the Byzantine period (late fourth century–early fifth century CE) and are part of the necropolis of Horbat Zikhrin. 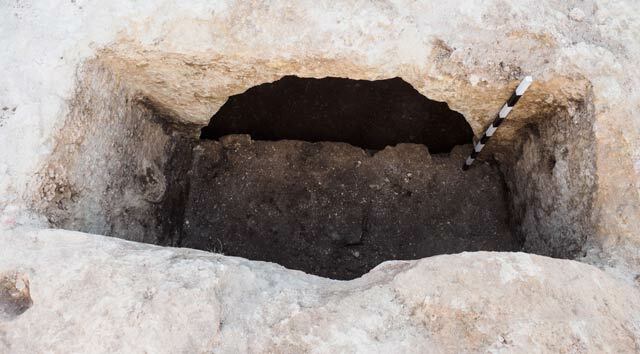 The double arcosolium is a type of tomb that is known from other sites of the Byzantine period in Israel as well. The quarrying of the tombs in the Byzantine period was done in an orderly manner, whereby tombs uniform in size were hewn side by side, without damaging each other. This indicated that the burial at the site was the responsibility of an entity that dealt with the quarrying of the tombs. Few funerary offerings were discovered in the excavated tombs, due to plundering. The pottery vessels from the Umayyad and Abbasid periods may indicate that the tombs were robbed then, or that earlier tombs were used for later burials. This issue will be examined later-on in the research. 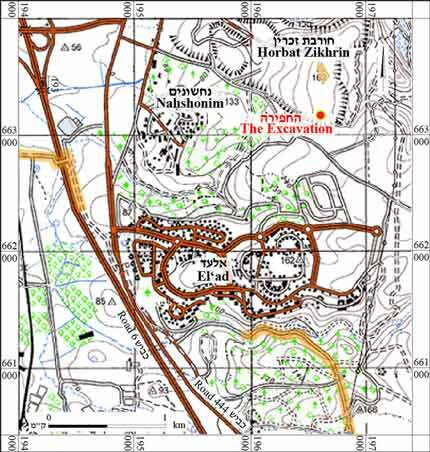 The results of the excavation and those of previous excavations at the site indicate that the necropolis of Horbat Zikhrin extended south of the settlement, over an area 300 m long. Fischer M. 1983. Horvat Zikhrin – 1983. HA 82:30–32 (Hebrew). Fischer M. 1985. Excavations at Horvat Zikhrin. Qadmoniot 71–72:112–121 (Hebrew). Fischer M. 1994. Horvat Zikhrin – 1987/1989. ESI 12:40–44. Haddad E. 2000. Rosh Ha-ʽAyin. ESI 20:45*. Haddad E. 2007. 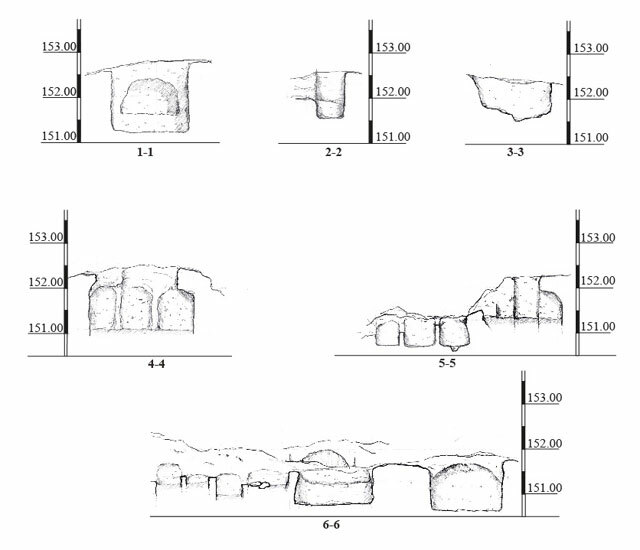 A Burial Cave from the First–Second Centuries CE and Double-Arcosolia Tombs from the Fourth–Fifth Centuries CE on the Fringes of Horbat Zikhrin. ʽAtiqot 56:45–57 (Hebrew; English summary, pp. 74*–75*). 6. Area A, looking north. 7. Area B, looking north. 8. Tomb 12, looking east. 9. Tomb 27, whose ceiling was removed, looking northwest. 10. Tomb 19, whose ceiling was removed, looking west. 11. Tomb 28, whose quarrying was incomplete, looking north.